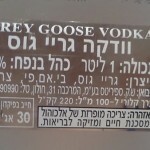 The Chetzi Chinam supermarket chain is selling Grey Goose Vodka imported by S.K. Spirits without a hashgacha or approval from the Chief Rabbinate of Israel. The same product when imported by the Ackerman Company is reliably kosher and the label states clearly the item is approved by the Chief Rabbinate of Israel. Regarding alcoholic beverages, there are often issues pertaining to their kashrus including ‘Nesach’ and concerns regarding the origin of ingredients. At times a large company will allocate special lines for kosher runs and therefore one should not rely on the kashrus of a product without the Chief Rabbinate’s approval, even a product that is known. 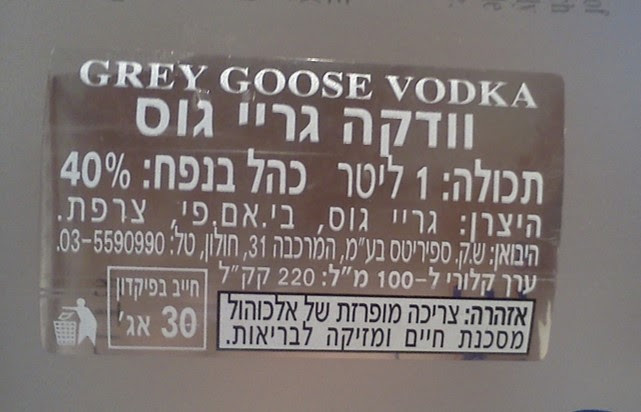 The London Beth Din (KLBD certification) lists Grey Goose L’Orange, La Poire, Raspberry and Vodka as being kosher and pareve. No mention of special ‘kosher runs’, and their authorisation is without having their symbol on the lable, so that would indicate that it is approved whether or not it has a symbol on it. Does the London Beth Din’s list take responsibility for all products under those brand names in the world, or only those sold in England? That is indeed a good question. I would suspect it depends on the product concerned. I would not think that vodka is likely to be a problematic product, but you can always contact them on the phone: +44-20-8343 6255, productt enquiry line: +44-20-8343 6247, email: info@kosher.org.uk. You could ask to speak to Rabbi Conway, the director, who would definitely know the answer to this question. When I have asked him about alcoholic drinks in the past he has had information about all the worldwide manufacturing plants of the companies concerned.